Billy Hanson is a writer and filmmaker, with projects ranging from music videos and comics to web series and films, including Lightning Dogs on Funny or Die and the acclaimed adaptation of Stephen King's Survivor Type, lauded as "one of the most jaw-dropping adaptations of (King’s) ever made…"
He has also written for the horror anthology comic, Grimm Tales of Terror and his first collection, Spider Season, will be released on October 9th, 2018. Born and raised in Maine, Billy now lives in Los Angeles with his wife and son. In this day and age, it seems there is a shortage of science fiction and horror anthologies. Growing up there was a plethora of books to choose from; however, as an adult, it seems as though there aren't nearly enough. Enter Spider Season by Billy Hanson. Spider Season is a collection of seven short stories and three screenplays written by Hanson. The stories are all quite diverse. The reader's first stop starts with a bang that leads an insomniac to rest. Further along the way are some screenplays, one of which involves a robot detective who has just been reactivated after many long years. Eventually, readers will find themselves having a wild rock 'n roll night with the Kicks. I read Light Sleeper after the sun had gone down and I was settling into bed. I decided it would be my sample chapter and I'd read the rest the next day. After I read it, man oh man, did I feel paranoid. Hanson has a knack for writing suspense that will string you along till the bloody end. Of course, this isn't all that Spider Season has to offer; it isn't just horror, it's prime storytelling. Music in the Gun Room was tragic and heartfelt; short stories rarely bring emotions out in me, but I suppose that says a lot about Hanson's writing. In such a short span of time, he was able to draw out this coming-of-age story that began promisingly and ended in a cold, but satisfying way. All in all, I took pleasure in reading Spider Season and I believe most anyone who picks it up will enjoy it as much as I have. 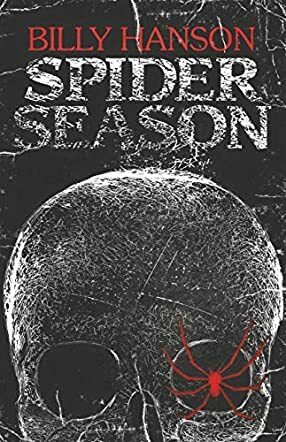 Enter the world of the paranoid, obsessed and unbelievable in this collection of short stories - Spider Season by Billy Hanson - that will make you gasp and question the human mind. Each of the stories tackles the weird and wonderful behaviour of seemingly normal characters. A man obsesses about his own death until the choice is made for him. The small girl who can unleash magical powers and curses if she feels threatened. The teenager and his rock band discover a deep-seated rage which gets out of control one night with devastating consequences. Once you enter the world of Spider Season, the impossible suddenly seems possible. The quiet and unassuming people that you seldom notice rise up and become your worst nightmare. Spider Season by Billy Hanson is unique as he covers a wide range of writing styles and genres very well, from a psychological horror to a futuristic detective story. Each of the short stories in this compilation has great three-dimensional characters and excellent plots, each with the perfect amount of conflict and suspense woven throughout. The author also includes excerpts of three screenplays, Nylah’s Magic being my favourite, and one I would love to see in full. Billy Hanson clearly is an all-round excellent writer with an eye for detail and a fantastic imagination when building believable characters and story lines. Harold in Music From The Gun Room was completely vile and nauseating. In She Was Perfect, the whole story line was disturbing and Cyrus completely delusional and spine-tingling. To build such great plots, characters and diverse stories is an amazing feat and Billy Hanson is an author I would like to read more from. Spider Season by Billy Hanson is a refreshing collection of short stories, written with skill and unusual clarity, all exploring the depths of the distorted minds of the characters. The cast is impressive, featuring characters from all walks of life — Trevor is married to Rebecca, and he suffers from an insomnia that culminates in a horrible way; teenage Henry falls in love but behaves in an unexpected way towards his mates, including the object of his love, out of an excess of jealousy; Cyrus succeeds in luring Christie and sells her off, and many more. This is a collection of stories about people who are strange, characters who are emotionally on edge. The writing is focused and the author builds each story on a single idea and keeps the reader engaged from beginning to end of each tale. For instance, when Cyrus sets eyes on Christie, he thinks to himself, “She is perfect,” and the reader is intrigued, thinking he’ll get her to fall in love with him. But the end is a surprising twist. The shock you experience when you realize that the dinner and the dessert and all the talk had only been a build-up to the ultimate betrayal. Billy Hanson creates contrast when the narrator says: “Christie forced every smile. Cyrus pulled every smile back about twenty percent.” These stories are awesome for fans of horror, especially the first one, and nothing is ever what it seems in Spider Season. It’s a gorgeous treat, indeed, and the writing is masterful, the plots cunningly done. I couldn’t stop reading from one story to the next. An exciting and absorbing collection with an irresistible appeal to fans of horror and short stories, verging on the dark side of human emotion, these stories capture the sense of fear and paranoia in the characters and they do so in a superb manner. These beautifully narrated stories will keep you tense, rattled, and surprised as you follow how the psyche of each character unfolds, allowing their fear to take hold of them. Trevor can’t sleep, obsessed with his fear of something he doesn’t even know, until it materializes... When Jeremy, the wood cutter, picks up the ax, what moves him? Such are the kinds of stories you find in Billy Hanson’s Spider Season and they make the narrative stand out with the gore, the blood, and the chills. These are stories that establish Billy Hanson as a master of the dark and the gory, reminding readers of the nightmares that assail them, making them wake up dripping with blood. The language is beautiful and the author’s gift for balance and conciseness comes out beautifully in the writing. He blends the gift of prose with the uncanny ability to penetrate the depths of the twisted minds of his characters to create a world that attracts and frightens readers. The stream of consciousness is one of the elements I enjoyed in the stories. Another thing is how the setting reflects the mood or contradicts the mood of the characters. Writing about Trevor, Billy Hanson says: “Despite the chill in the room, his skin was damp, hair matted to his forehead. For some reason, he was afraid, unable to piece together what had happened to him, like a drunk realizing that he’s somehow made it home.” Spider Season is one of the best selections of short stories I have read. You’ll keep the lights on after reading this at night. Spider Season by Billy Hanson is a collection of ten short horror stories for fans of the genre. It starts with Light Sleeper, about a man who has trouble sleeping since he and his wife moved into a new apartment. It’s a bone-chilling story that also gives the collection its title, and made me wish that I will always be a heavy sleeper. The second story is The Clearing, where some of its adolescent characters, the goriness, and its ambiguity as to whether supernatural evil is involved remind me of Stephen King’s horror novels. The monochrome illustrations by Karl Slominski visually captured and enhanced the essence of the stories. There’s a link provided for readers to see his impressive works in color. Almost halfway through the collection, Hanson gives us an interlude titled Three Screenplays. Through his perspective as a screenwriter, he gives his thoughts on great scripts that went unproduced and tells about his participation in a short screenplay contest that led to the creation of Nylah’s Magic, Electric Detective, and The Red Helping Hand－which are included in Spider Season for our reading pleasure. Every story comes with a twist, and while readers might see how one or two plots play out, the horror element comes in different forms for each of them, and personally I don’t see a dominant theme that ties the collection together. The stories and characters are wonderfully diverse, where frightening creatures, especially people consumed by the dark side of human nature, contribute to the terror of Hanson’s Spider Season. Simply put, a great read!